In math, a Möbius strip is a shape with one continuous surface, rather like a twisted loop. 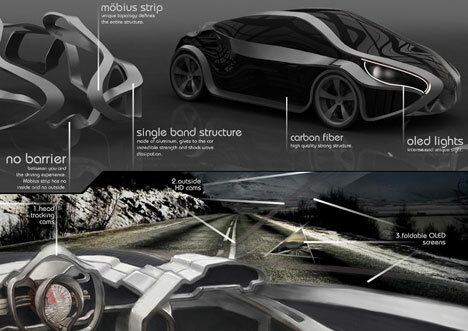 Designer Tommaso Gecchelin applied the principle of the Möbius strip to a car; as it turns out, the continuous, bending strip translates quite well to automotive design. The gorgeous Möbius car features a body that uses the concept of the Möbius strip to unify the interior and exterior in a beautifully unconventional way. The twisting strip wraps around the body and gives it a futuristic shape almost worthy of Tron. The design incorporates safety features like flexible OLED screens to eliminate blind spots, external HD cams and head-tracking cameras. These features further serve to unify the interior and exterior by bringing the outside in. 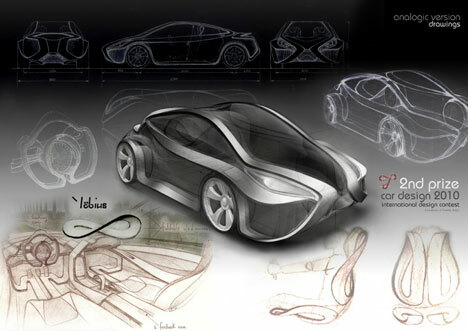 The fantastically futuristic design won second place in the Concorso Car Design contest 2010. See more in Concept Vehicles or under Transportation. November, 2010.